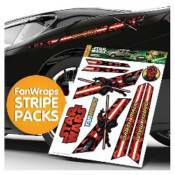 Star Wars Darth Maul Stripe Pack FanWraps Car Decals: Take your vehicle from average to fantastic with FanWraps! This Star Wars Darth Maul Stripe Pack FanWraps Car Decal is a predominantly red stripe with markings akin to those seen on the legendary Sith Lord, along with Darth Maul himself in a battle stance with his lightsaber at the ready. Complete with the words "Darth Maul" and the Star Wars logo in red, this awesome car decal would add some great Star Wars flair to your ride! Ages 15 and up.